However, even more intriguingly, there is another window of opportunity for primordial black holes with much lower masses to make up all of dark matter. In today’s paper, Inomata et al. show that it’s possible to produce enough PBHs with masses of around (the mass of the asteroid Ida) to make them a viable dark matter candidate, without violating the new and very stringent constraints on the number of allowed PBHs from the Subaru Hyper Suprime-Cam (see the results here). What is a primordial black hole? Primordial black holes are thought to have formed in the very early universe, typically within the first second of its existence. They are a popular dark matter candidate because they don’t require any new physics beyond the standard model. After the period of exponential expansion known as inflation finished (see this astrobites article for an explanation), patches of the universe that were a lot denser than average could gravitationally collapse to form black holes. Smaller and lighter PBHs would have formed first, whilst larger and heavier PBHs would have formed later. However, since PBHs evaporate via Hawking radiation, all of the lighter ones should have completely evaporated by now. In fact, only PBHs of masses (the mass of Ida’s moon Dactyl) or higher could still be around today. The number and size of overdense patches capable of forming primordial black holes in the early universe depends on exactly how inflation happened. Since there are lots of viable inflation models which can be difficult to distinguish between, primordial black holes can act as a useful probe to differentiate between them. They are particularly handy because they are much smaller than the scales that the Cosmic Microwave Background can constrain, so they enable us to zoom in and see otherwise hidden detail. If we knew the number of PBHs in the observable universe, the correct inflationary model would possess distinct features according to this number. Conversely, if the inflationary model was fully specified, we would know how many PBHs to expect. For now, the best we can do is to place constraints on the number of PBHs there can be, which in turn can help to rule out inflationary models that might produce too many. New constraints from the Subaru Hyper Suprime-Cam have put tougher restrictions on how many PBHs there can be in the mass range that spans the mass of the asteroid Ida ( ) to the mass of the Earth ( ). The telescope searched for microlensing effects (see this astrobite for an introduction to microlensing) from PBHs passing in front of stars in the Milky Way and M31. If there were enough PBHs to make up all of dark matter, there should have been many microlensing events. However, they only found one possible PBH candidate which their analysis could neither confirm nor rule out. Comparing their lack of detections with the expected number of events (if PBHs were to make up all of dark matter) meant that the constraint on the number of PBHs tightened by up to 3 orders of magnitude. Inomata et al. 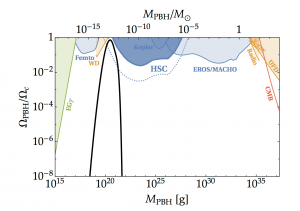 show that it is still possible to produce enough asteroid-mass PBHs to make up all of dark matter despite these new constraints shown in the dark blue shaded region of Figure 1. Figure 1: Plot of the ratio of PBHs to dark matter against PBH mass. If for a particular mass, then PBHs of that mass make up all of dark matter. The dark blue shaded region is ruled out by the newest constraints. The black solid line in Figure 1 shows the ratio of PBHs to dark matter for a particular inflation model known as double inflation. The number of PBHs peaks at around and avoids the surrounding observational constraints indicated by the shaded regions which are ruled out. If observational constraints tighten further, this model will have to be adjusted for asteroid-mass PBHs to remain a plausible candidate for dark matter. In particular, if observations could limit the ratio of PBHs to dark matter to being much less than 1 on all mass ranges, we will be able to successfully rule out PBHs as making up all of dark matter. However, if PBHs are directly detected, or it is confirmed that the black hole mergers detected by LIGO/VIRGO were indeed primordial, it may still be possible to confirm that dark matter is made up of primordial black holes.